The 1960s were a decade of great vitality and experimentation in all fields, from art to fashion, from architecture to design: they were years of great historical change, the years of the Beatles, Andy Warhol and Pop Art, while the Industrial production of plastic was also booming. In Italy a new design idea was being developed, inspired by the protests and movements of avant-garde art that aimed to bring new blood and beauty to everyday objects: thus we saw the birth of the Arco floor lamp by Achille Castiglioni (1962), the Brionvega radio TS 502 (1965), the inflatable Blow armchair by Zanotta (1968), which are to this day icons of Italian design throughout the world. Icons just like the table clock Cifra 3 and the wall clock Dator 5 which were made in Solari during this unique period of Italian design. "The product was synonymous with Italian style, originality and inventive elegance. It was a surprise. And the style is primarily a distinctive notion, the capacity of relationship, and the communicative attitude of the product and the object. The products of Italian design were the first protagonists of this communicative function." Gino Valle (links to section on Valle - like Cifra 3 website), architect, designer, painter, of world renown, made his mark in the design of the flip roller (patented in 1966) and, at the end of the 60s, in the unmistakable form of Cifra 3, the smallest of the direct-reading clocks. Design as a language of objects, such as form that transforms the relationship of objects with man, as a communicative force that changes the environment and the space in which they are placed. 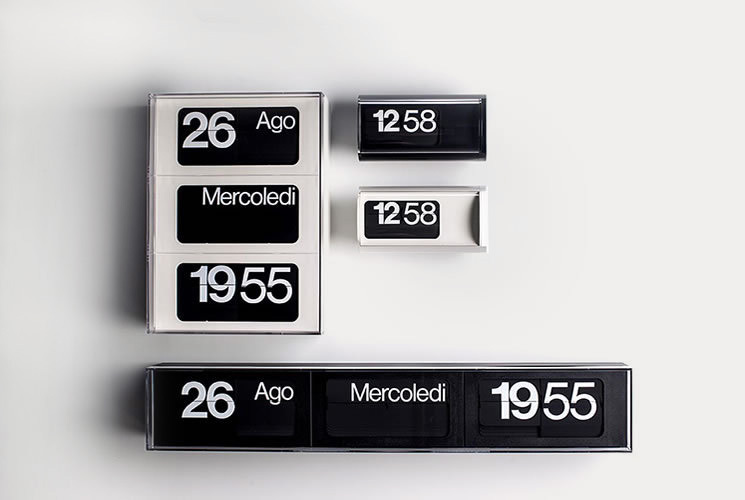 The design by Solari, with Cifra 3, is part of the permanent collection of the London Science Museum and the MoMA (Museum of Modern Art) in New York where the flap clock provides information to the public.